After three years of postponements, innumerable revisions and committee conferences, the Mint Act of 1873 was finally passed on February 12, 1873. This same Mint Act was to be referred to in later years as the "Crime of '73", because it was alleged to have been passed by a sleepy Congress with no debate and little consideration. At the time, neither the general public nor Congress realized just what the new law's impact would have on the nation's coinage. One of its consequences was to abolish the "standard dollar" (as opposed to the trade dollar) as well as the two-cent piece, silver three-cent piece and silver half dime. It also increased the weight by an infinitesimal amount in the silver dime, quarter dollar and half dollar. And it is this tiny increase in weight that created a distinctly different type on the ten-cent pieces in the years 1873-74. Placing arrowheads on either side of the date was previously used on half dimes, dimes, quarters and halves in 1853, '54 and '55. At that time they also signified a change in weight, but a decrease. The weight of these circulating coins was decreased to discourage their widespread hoarding and melting, as their intrinsic value was greater than their face value. One might speculate that the opposite could be true as well and could be the reason for adding more silver to these denominations twenty years later. The actual reason is not so logical, however. Two of the legislators responsible for the Mint Act of 1873 were Senator John Sherman and Representative William Kelley. These two men had a vision that someday United States coinage would be accepted worldwide. This universal coinage system would see the U.S. dime, quarter and half dollar accepted throughout the civilized world and used as circulating bullion pieces (the stella or four-dollar gold piece was a later offshoot of this universal coinage system, as promoted in 1879-80). Sherman and Kelley reasoned that the only obstacle standing in the way of realizing their dream was to convert U.S. silver coinage from the archaic English system of weight to the more rational metric system. To that end, a provision was included in the Mint Act that added a miniscule amount of weight to the dime, quarter and half dollar. Formerly, the dime weighed 2.49 grams; after the Mint Act, the dime weighed 2.5 grams. A minute adjustment by anyone's reckoning, but one that would increase the weight just enough to make ten dimes, four quarters or two halves weigh exactly 25 grams, which was also the weight of a French 5-franc piece. The Mint decided to note the increase in weight by adding arrowheads on the obverse at either side of the date. Chief Engraver William Barber added the arrowheads to the previous Hughes-Gobrecht-Longacre design. The arrows were punched into the dies separately, and their positioning varies from one die pair to another. However, regardless of whether they were punched in higher or lower relative to the date, dimes of 1873 always have the arrow-points level, while they point upward on 1874 coins. Once the new design was released, officials began scrupulously melting down coins dated 1873 that did not have the arrows motif. In the process, one of the most famous of all 19th century rarities was created, the 1873-CC No Arrows dime. It is a unique coin, the only piece known to survive the melting pot. Adding the mintages together for the six issues of Arrows dimes yields 6,042,308 coins. Most of the Philadelphia and San Francisco issues are readily available, and they are quite popular in all grades as type coins. Only the Carson City pieces are truly rare in any condition. Both Carson City issues are difficult to locate problem-free, with most of the surviving population being corroded, damaged or impaired in some manner. A total of 1,500 proof Arrows dimes were made in the two years. They are highly collectible coins and are eagerly sought by type collectors. 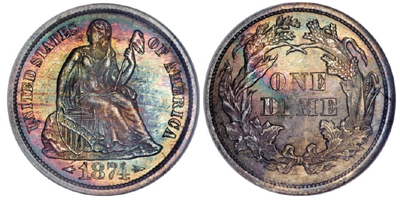 Though 800 proofs were coined for 1873, the 1874 edition, with its lower mintage of 700 pieces, is more often seen. Counterfeits have never been a particular problem in this short-lived series. The only well-known counterfeits are of the very rare 1874-CC. These pieces are easily detectable by most collectors and dealers, as the die characteristics are well known for this rare, high-profile date. An interesting fact for authentication purposes is that early Carson City dimes have only 89 reeds on the edge, while their Philadelphia counterparts have 113, making it impossible to manufacture a convincing counterfeit Carson City dime from a Philadelphia coin simply by adding the mintmark. Grading Arrows dimes is similar to the grading of other dimes of this type minted 1860-91. High points to show signs of wear first are the breast and knees of Liberty and, on the reverse, the ribbon bow and tips of the leaves. After 1874 the arrows on either side of the date were discontinued, even though the weight of the coins in subsequent years remained the same. The silver dime retained its new weight, as did the quarter and half dollar, and all three denominations remained on the metric system until silver coinage was terminated in 1964. And what became of Senator Sherman and Representative Kelley's dream of a universal coinage system? Sherman later proposed to remove the eagle from the reverse of coins so their silver content could be inserted in place of the bird. He actually believed that adoption of the metric system for coinage would lead to Europeans using our coins as currency. His dreams, however, wilted soon enough in the bright light of reality. The facts were that the value of minor coinage was independent of its actual weight in bullion. Such small denomination coins only circulated in countries where they could be exchanged for what is known as "standard money," that is, currency-silver dollars and gold coins. One of the great ironies of Sherman's and Kelley's vision of a universal coinage system is that coins and currency were still not legally convertible in this country in 1873, ten years after specie payments had been suspended during the dark days of the Civil War. But their dream, and the conversion of dimes to the metric system, did leave an enduring numismatic legacy for collectors of 19th century United States coinage. BIBLIOGRAPHY: Ahwash, Kamal M., Encyclopedia of United States Liberty Seated Dimes 1837-1891, Kamal Press, Wallingford, PA, 1974. Bowers, Q. David, Silver Dollars and Trade Dollars of the United States, Bowers and Merena, Wolfeboro, NH, 1993. Breen, Walter, Walter Breen's Complete Encyclopedia of U.S. and Colonial Coins, F.C.I. Press/Doubleday, New York, 1988. Carothers, Neil, Fractional Money, A History of the Small Coins and Fractional Paper Currency of the United States, John Wiley & Sons, London, 1930. Greer, Brian, The Complete Guide to Liberty Seated Dimes, DLRC Press, Virginia Beach, VA, 1992. McCloskey, John, (Editor), The Gobrecht Journal, Collective Volume Number One, Liberty Seated Collectors Club, Kettering, OH, 1980.